How does your day begin? Do your students come in quiet and orderly? 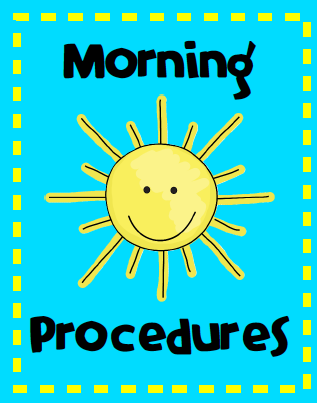 Beginning of the day procedure is an area that I’ve experimented with since I began teaching. I’ve tried some of the things you’ve probably tried, too. Put your backpacks away, turn in homework, and begin D.E.A.R. time. Some students had a book and others didn’t. Those that were “shopping” for books, were disruptive to the quiet, reading environment. Then there’s the inevitable problem of tardy students. I thought it would encourage students to arrive on time if I began a teacher-directed activity as soon as the bell rang. Our calendar time activities made very little difference in the amount of tardies my class had. I still had parents who wanted to talk to me or ask a quick question when they dropped off their tardy child, even when they could see we were in the middle of a lesson. Here’s my latest idea to “take for a spin”! After students put away backpacks and turn in their homework, they will get out their “Bell Work” packet. They will have a week’s worth of “Bell Work” in their work folder, which is kept in their desk. If they finish with their work early, they will put the packet back in their folder and begin D.E.A.R. time. With students finishing their work at different times, there shouldn’t be as many students “shopping” for a book which should help with the noise level. Since this is not a teacher-directed activity, I can answer parents’ questions, meet with students, or complete beginning of the day paperwork – attendance/lunch count. I just finished my first “Bell Work” packet. It has 2 weeks of work, along with the answers. The math questions are on the 3rd grade level. These questions will be review for an average 3rd grade class or enrichment for a 2nd grade class. « Valentine’s Day: You’re All Heart! We do Accelerated Math first thing. I am able to get everything ready before they arrive. It is on their desks waiting for them. It has been great for me! I put morning work on the desk at the end of the day before I leave. If for any reason I forget, it is in the folder marked Morning Work at the front of the room so it is very easy to grab. I usually keep it filled for about 2 weeks worth of work. When we have our faculty meetings in the morning that run ten minutes past the start of the day (we have a staggered start time), my students have been so responsible. The first to arrive takes out the sheet of his choice and passes them out! It is bound into a book that the kiddos keep in their desk. The day of school is the page number they work on that morning. We go over it at snack time! It is awesome!